Once upon a time, there was this church that wanted to walk on water more effectively. The leadership saw a need for walking on water, alright, but there hadn’t been much success with it in recent years, and it occurred to them that they might be going about it all wrong. So they read a few books, attended a seminar or two, and researched the web until finally they decided they had the answers. Then they offered a class to their members so they could equip the saints with more effective water-walking. The first thing on the syllabus was to raise awareness. Sure the members of this church had all heard of walking on water, but none of them had ever done it or even seen it done. In fact, the whole idea was almost a fairy tale notion. They didn’t actually take it seriously. There did not seem to be any practical reason to do it, and so… functionally speaking, they did not even care. Not that anyone would ever say it like that. They CARED, sure. Who doesn’t? But at a functional level, it was clear that any care about the subject was limited to hypothetical and metaphorical purposes. Thus, awareness was a first step. Once they raised a sufficient awareness, which wasn’t really too hard to do, the leadership needed to help their people get a deep understanding of the complexities of water buoyancy. And the complexities are more complex than you would initially imagine. To begin, your feet (the part of your body that will actually contact the water when walking on it) are not buoyant at all. Add to this issue the fact that natural physics tells us that a human being standing erect creates a spear effect which would pierce the water and completely sink the human even if the feet were buoyant. The complexities do not end with modern physics – not by a long shot. For the New Testament accounts of walking on water depict a stormy sea. It is one thing to walk on a placid water, quite another to walk on waves amid heavy winds. Once these non-buoyant feet find themselves on a shifting, rocking, waving surface, which presumably would be slick too (ever walk on ice??? ), there is the added complexity of balance. And balance, of course, is related to fluid in your ears and several other bodily systems including vision. Church leadership determined that a better understanding of all these complexities would be a foundation for more effective water-walking. This Bible class had only begun to open a Bible at this point on the subject. So much concern expended on awareness and complexity issues had leadership researching all the experts except Jesus. 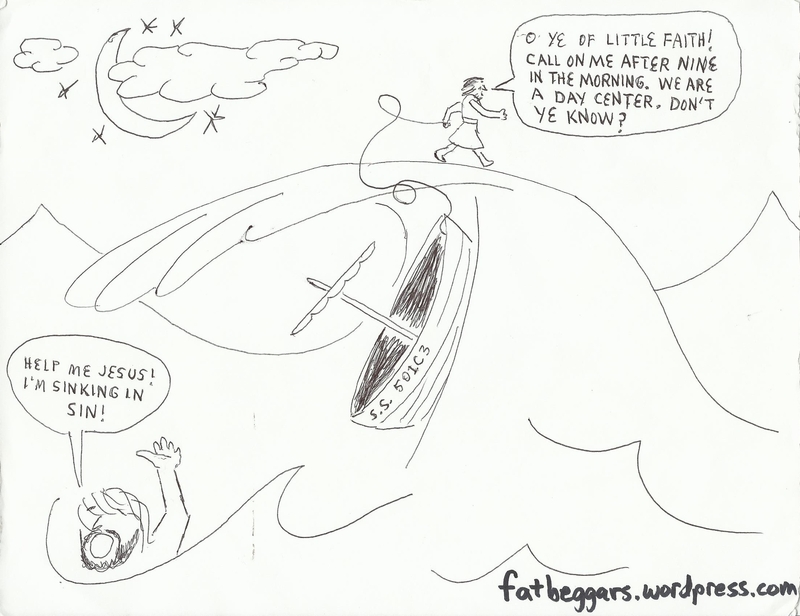 Kudos, of course, for getting out of the boat (metaphorically speaking), but the notion of fixing their eyes on Jesus (a rather simple idea) never quite occurred to them. Sunday morning. What they didn’t teach me at Sunset…was that doing “Prophet work” …. would also greatly blow back on my wife and kids. Especially the kids. They didn’t volunteer for any of what happened to me. If all the churches are guilty then why throw sh.. on the one where they attend. Either maybe attend somewhere they don’t or stop naming (and do the Agent Church without being sloppy) stuff. I hurt and cried about that. Regretted I hadn’t done more to protect them and the innocent sheep. Be warned … and consider the Agent N needs a place where he is loved.